Heavy winds and storms were forecasted for the weekend of the E Spring Regatta. Somewhat miraculously, the race committee completed the five race regatta with two on Saturday afternoon and three Sunday morning. After average wind speeds in the 15-25mph range and light rain Saturday, the weather tempered just enough to send the fleet out for racing around 1pm in a strong Easterly breeze. With the mark just off Black Point, the racecourse saw many long starboard tacks on the upwind beat with some SE puffs coming off the south shore. Boats often jibed shortly after the offset for similar reasons. The first race didn’t have many big swings amongst the leaders. I-1 would have finished the race in the top five but was OCS, while I-49 capsized on a jibe early on in the first run. The second race favored the right side on the first beat, but a dying breeze made for a very tricky last lap for most boats. I-9 went from fourth to first on the last upwind beat, coming in from the right side to pass leaders I-49 and V-736. I-23 went from 7th to 12th on the final beat, ultimately letting boats to the right as well. Overall it was a beautiful long racecourse with good breeze – almost every boat took four and was fully hiked every minute. Not an easy condition for someone’s first few races of the year, but great practice. Sunday had a building Southwesterly breeze that may have reached an average of 18-20 by the final race. It was a war of attrition at the leeward mark roundings, as several teams saw their hard-earned leads vanish with a poor takedown or other mishap. All starts were somewhat pin favored, and the breeze was a traditional oscillating breeze that always seemed to average out in the same direction. The I-1 team of young 29er sailors had a magnificent first race leading at probably every mark. They had great technique off the breeze and were difficult to catch. In race two, habitual heavy-air favorite WH-77 demonstrated fast upwind boatspeed and conservative tactics to stay in the lead and fend off I-49 and I-2. All boats had four crew, many of who wore drysuits and wetsuits to brace for a spring swim in the 50 degree water. It was a testament to the skill level of the E Fleet to handle such big breeze with relatively few tip overs. A big thank you goes out to regatta chair Pete Strothman for organizing this regatta, as well as all of the volunteers at the Lake Geneva Yacht Club. 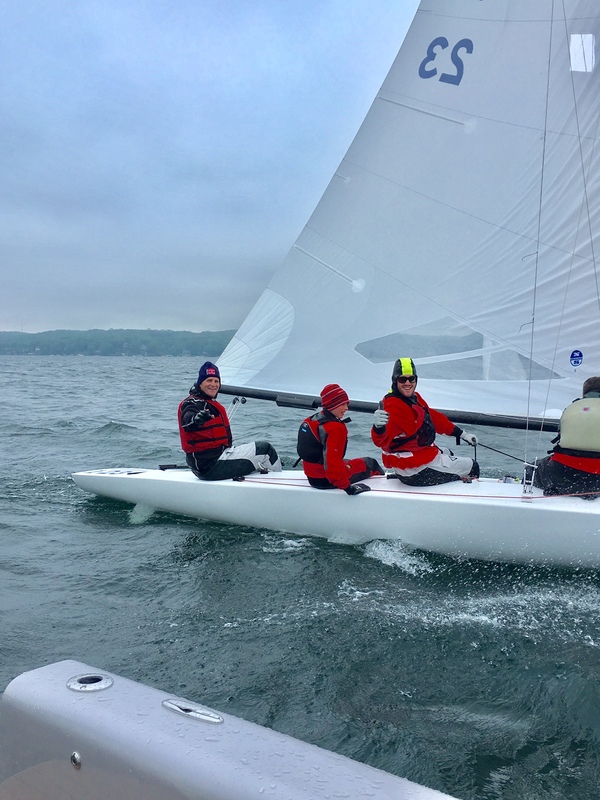 Sailors travelled from many different clubs for what has become a fun springtime tradition to kick off the sailing season, and the race committee and yacht club delivered a great event.